SkylinkNet is a do it yourself friendly Internet enabled security alarm and automation system that connects to your home's network and uses wireless sensors to protect your home, cottage or remote property. In case of an alarm, the loud 110dB built in siren sounds and push notifications are sent to users smart phones. SkylinkNet uses easy cloud based remote access to make set up simple. 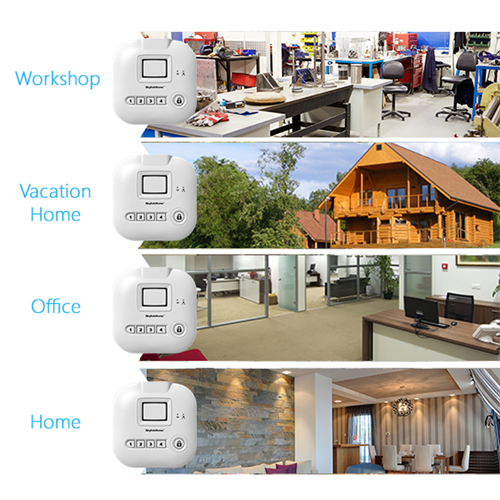 Add compatible SkylinkNet cameras, plug-in and wire in automation modules for a complete and easy to use smart home solution. There are no set-up or monthly fees and the free iOs and Android apps allow the system to be armed, disarmed and controlled remotely from virtually anywhere. In case of an alarm, a push notification is sent to your smart device and a loud siren sounds on the SkylinkNet Hub in your home. You can also receive notifications when doors, windows or garages are opened. SkylinkNet works with Amazon Echo and Dot, as well as IFTTT (If This Then That) cloud service, so you can integrate it with all kinds of other devices including August, Nest and Hue to name a few. Plus IFTTT allows custom events such as arming the device when you drive away from home. 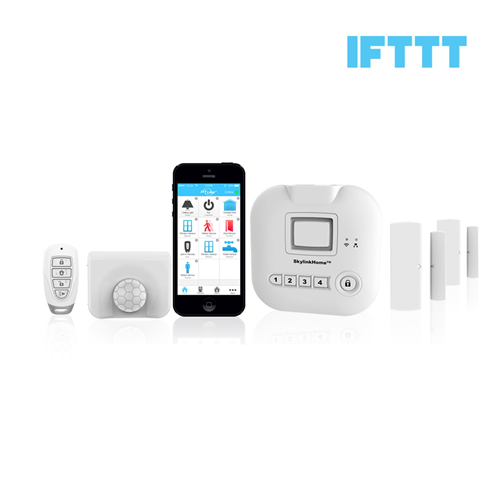 Learn more about IFTTT integration at http://skylinkhome.com/skylinknet-ifttt . 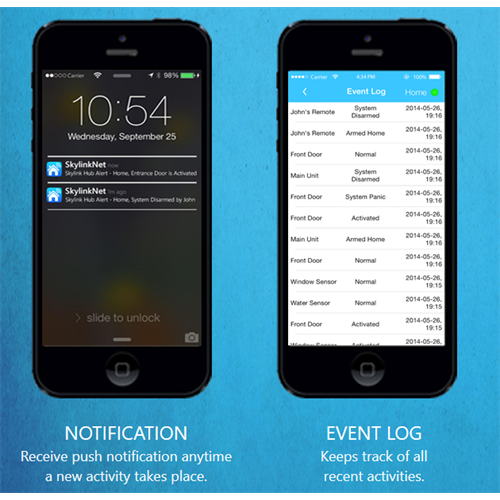 You will also receive a push notification when the system is armed, disarmed, or a panic button is pressed. 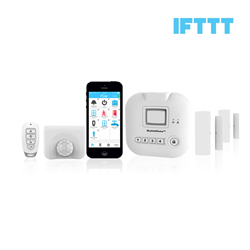 Up to 6 different alarms may be installed in different locations like home and cottage, managed by a single account so the whole family can be in control of one or multiple properties. 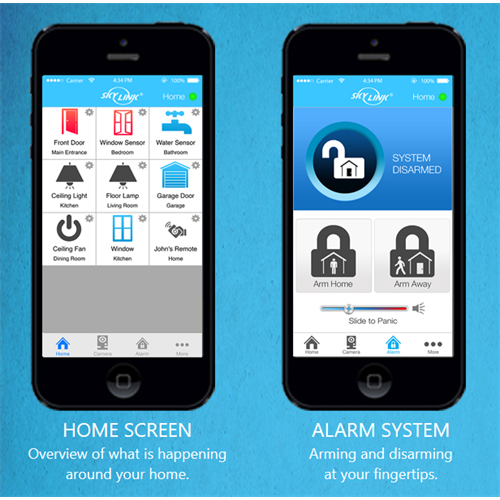 With the starter kit, arming and disarming is handled by the phone/tablet app or key chain remote. Add a wall mount keypad for convenient arming and disarming, additional key chain remote, sensors or even cameras. You can also add a telephone voice dialer for back-up communication in case the Internet connection goes down or if you need to voice notify friends or neighbours. Don't forget to buy batteries. You will need 1 AA and 2 AAA batteries for the included sensors. Batteries NOT included. 2 AAA and 1 AA required for this kit.